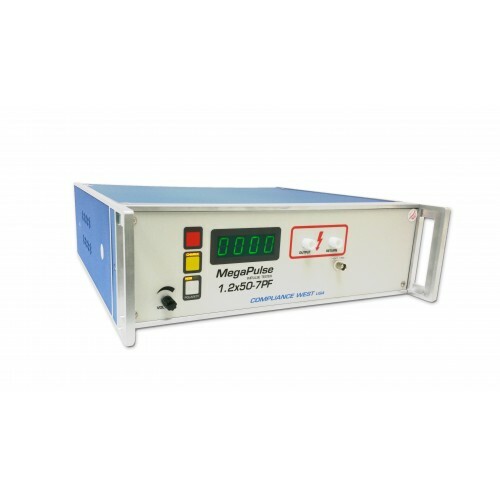 The MegaPulse 1.2x50/8x20-2.5P 12 ohm is our 2.5kV, 12Ω combination tester, with a 30 second cycle time. 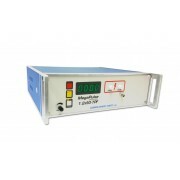 It can produce a combination test waveform at 12 ohms 2kV, in tolerance with EN 60060. The MegaPulse 1.2x50/8x20-2.5P 12 ohm features grounded outputs, and is acceptable for unpowered testing. Not for use for powered testing with a CDN. The MegaPulse 1.2x50/8x20-2.5P 12 ohm is equipped with a relay allowing switch selected polarity output. With the switch selected polarity output, users may opt for computer control via our option TestMinder MegaPulse, or PLC guided operation with our Relay Isolated Control board. The tester charges in less than 30 seconds. Sold with a one year warranty and calibrated to NIST Standards. A2LA Cal available at extra charge. Waveforms can be viewed in the Manuals Section below. 500V min, 12 ohm, not for use with CDN. 30 sec duty cycle, <30 sec. charge time. Outputs a combination waveform at 500 - 2.5kV, 12 ohms. Front panel switch allows waveform reversal. Grounded outputs are suitable for unpowered testing. 30 second pulse repeat rate. Can be controlled from PLC or LabView with Option RI. Outputs up to 500-2500V peak. Virtual Impedance of 12 ohms. Available TestMinder for computer control of long test sequences (32 bit Windows required). ANSI Calibration good for one year included, A2LA/17025 Calibration optional.